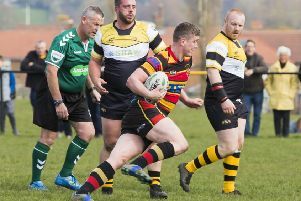 HEATH beat Bradford Salem for the second Saturday running at Shay Lane, this time by 47-14 to move up to third in Yorkshire One behind leaders York and Scarborough. They gave a clinical performance on a cold, damp and windy day on a ground where they had needed a late Ezra Hinchliffe penalty to give them a 26-23 win in the Yorkshire Shield seven days earlier. The visitors had Jordan Bradbrook and Peter Birkett back from injury while Eddie Cartwright replaced the unavailable Si Brown on the wing. Salem kicked off with the wind at their backs and immediately applied pressure. On five minutes Callum Harriett-Brown intercepted but was brought down by a high tackle. A second penalty followed and Fergus Marsden and Ian Downsborough led a drive which produced a try for No 8 Richard Brown, converted by Hinchliffe after seven minutes. Back came Salem and Jason Merrie, Peter Birkett and Alex McFadden had to put in some solid tackles. It looked as if Heath had stemmed the storm and Hinchliffe missed a penalty but Salem broke clear and a converted try made it 7-7 after 24 minutes. Jack Crabtree flicked a pass to the on-rushing Jordan Bradbrook and Heath restored their lead at 14-7 after 28 minutes. Hinchliffe relieved pressure and when Salem dropped the ball, Harriett-Brown kicked ahead and won a chase for the ball. Salem hit back to make it 14-19 on 34 minutes with a converted try under the posts. Martyn Barnes came on and made a couple of strong runs as Heath began to take the upper hand. Bradbrook dropped a pass as the try line beckoned. Conditions began to deteriorate in the second half. Heath kicked for position and the Salem defence struggled to hold out. A move involving Hinchliffe, Sam Pollard and Birkett produced a superb bonus point try for Harriett-Brown in the corner and a lead of 26-14 after 50 minutes. Brown was held up over the try-line and it came as no surprise when Birkett touched down and Hinchliffe’s kick made it 33-14. A 60 metre run from Harriett-Brown looked set to pave the way for Birkett to score but Salem managed to get him into touch. However, a scrum onslaught led to a penalty try and a 40-14 advantage after 62 minutes. Brown added to Salem’s misery with another try on 65 minutes, converted by Hinchliffe, but Salem prevented further damage before the final whistle. Victory takes Heath above Old Brodleians on points difference and sets up an intriguing match between the pair at North Dean next Saturday.